I enjoyed this book/workbook very much. It's filled with helpful information and it made me feel inspired and hopeful for a future with a little less anxiety and depression. I'd recommend this to anyone who has gone through or is currently going through some rough times. Coming through anything, at your own pace, is the way to grow and go. This workbook shares a reader's journey, on his or her time frame. 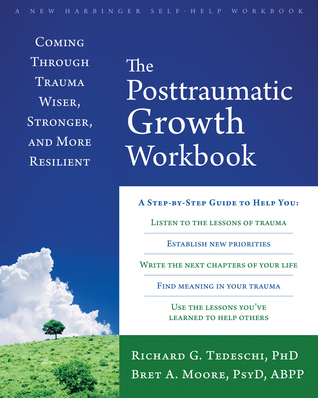 this book The Posttraumatic Growth Workbook from Richard G. Tedeschi and Bret A. Moore was given to me for an honest review.I enjoyed this book so much i really couldnt put it down.I found that the questions and what was written helped me to first understand and second to learn that this type of illness is a very inportant part of traumatic situations or events.I find that this book could help those with anxiety and depression as well while though the author has indicated that anxiety and depression are symptoms of pstd.I really think that if you find the need to improve yourself then read this book.it just might save your life or someone you love.